A mass of midsummer flowers — either freshly cut from the garden, or acquired from the local florist — can greatly enhance the beauty of a room. 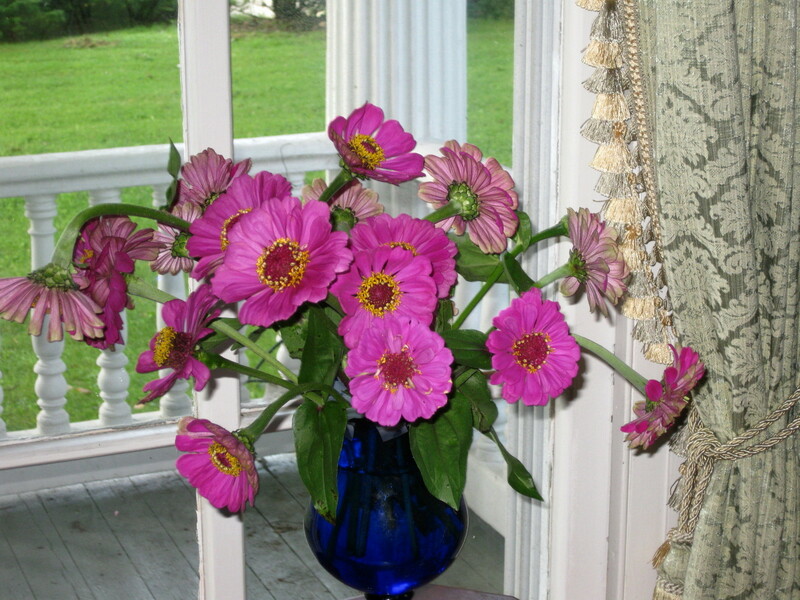 I’ve enjoyed a long and lavish season of cut flowers this summer, including the violet zinnias above, here arranged in a blue pedestal vase for my parlor window. Would you like to see more flowers on “decorative duty” in the house? Turn the page, and then click each picture for a full-size view. For the entrance hall bay, against a background of green and gold draperies: Azalea branches, blue delphinium, white hydrangea, yellow roses and pink snapdragons. For the parlor mantel: Yellow snapdragrons, fragrant ‘Casa Blanca’ lilies, purple buddleja and Japanese knotweed are reflected in a late-Victorian mirror. 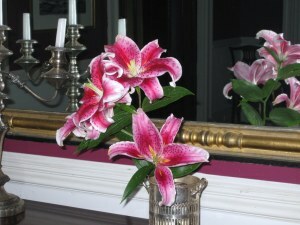 Here, a single stem of pink, fragrant ‘Star Gazer’ lily is reflected in a Federal gilt mirror in the dining room. 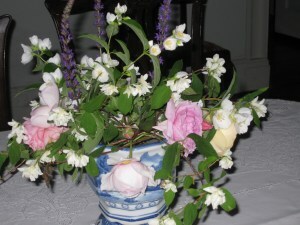 Stems of mock-orange and pink and yellow roses make an infinitely inhalable centerpiece for the dining table. 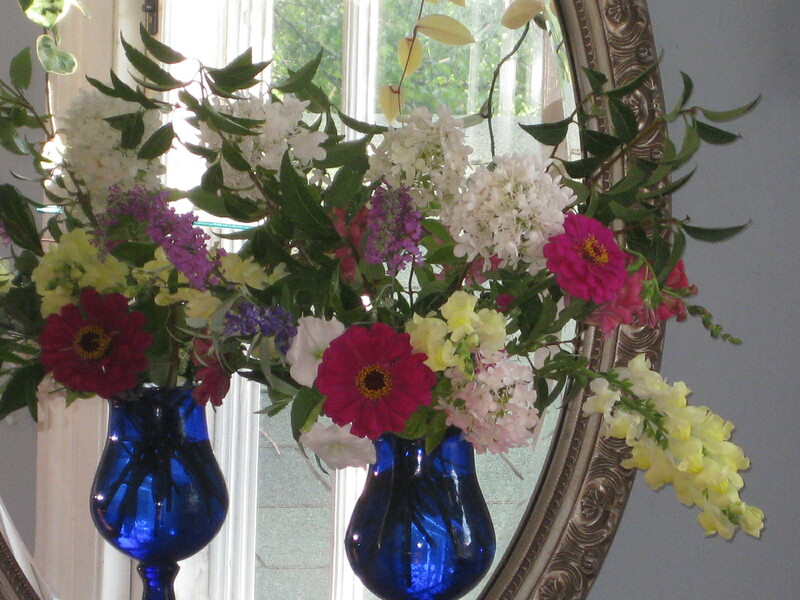 For the blue guestroom: A colorful collage of forsythia branches, violet zinnias, pink and yellow snapdragons, pink and white petunias and blue salvia greet an overnight guest. 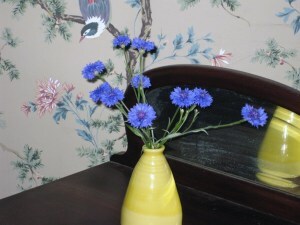 For a mirrored Victorian cabinet in the Music Room: Blue bachelor buttons in a small yellow vase make an informal display in otherwise very formal quarters. 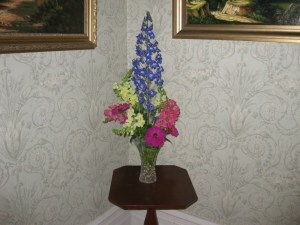 For a corner in the parlor, against a background of pale green and cream wallpaper: Blue delphinium towers above yellow snapdragons and purple zinnias, arranged in a crystal vase. 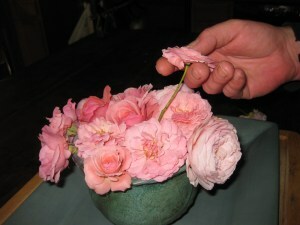 Destined for the Music Room, the final stem of rosa ‘Gertrude Jekyl’ joins other pink roses in a green earthen bowl. Don’t miss anything at A Garden for the House. Sign up for Kevin’s newsletter! Your house must smell and look heavenly! But what about your cats? I know Tiger and Camille are purrr-fect but have they ever tried nibbling on your flowers or (gasp) knocked down a vase?? Judy – the cats, happily, have never bothered my cut flowers. And the only houseplant they've nibbled at is the spiderplant. I must be very lucky! Kevin, the arrangements are beautiful, just beautiful. You've really motivated me to try my hand at arranging my own garden flowers. I'm psyched! Thank you. OMG – these are fabulous! I especially like the arrangements in the entrance hall, parlor mantel and guestroom. Very colorful and opulent. 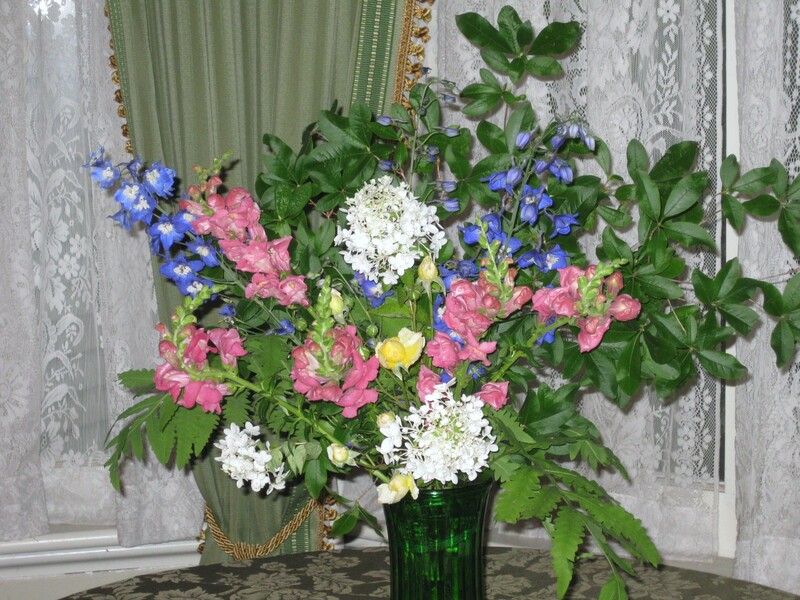 I had not thought to use forsythia and Japanese knotweed (knotweed grows as a weed here) as greenery for a mixed bouquet. Kudos, Kevin! Justin – I'm glad you feel inspired to “bring the garden indoors.” What do you have in bloom now? Janis – Thanks. I like to find unusual green branches to tuck into bouquets, or to use as background for flowers. I should probably do a post on greens alone! 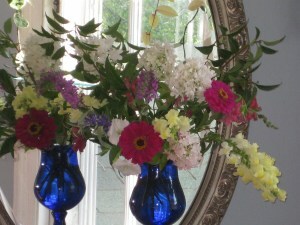 And if ever there was a summer to enjoy one's garden flowers INDOORS, not out, it has been this one! Hi Kevin, What a treat to see your masterful gardening skills at work!! You've created and carved in your yard very beautiful settings from vegetables to herbs and from a floral serpentine to a formal rose garden with some secrets as well. Very inspiring! For now, indoor plants will have to do. I forget the name of the fragrant plant behind your shed that you said would grow well indoors. And, do you recommend any websites for obtaining indoor plants. Thanks again for the tour!! Gib – welcome! Here at a Garden for the House, the winter months will deal almost exclusively with gardening indoors. I hope that you will stop by and comment often. As for the fragrant plant behind my shed: it's Pelargonium 'True Rose.' There are a number of recipes and beverages on this site (and more to come) that use this rose-scented geranium. My favorite source for houseplants? Definitely Logee's in Danielson, CT. You can visit them at http://www.logees.com. George – welcome! I do not decorate other people's homes…far too risky! If you feel you need help with flower arranging, here is my suggestion: Take pictures of your rooms, and show them to your local florist. 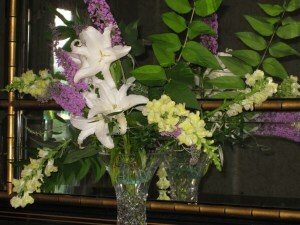 He or she will leap at the chance to create arrangements that compliment both the colors and the style of your home.